Cabbage rolls have always intimidated me a bit because of the cabbage. 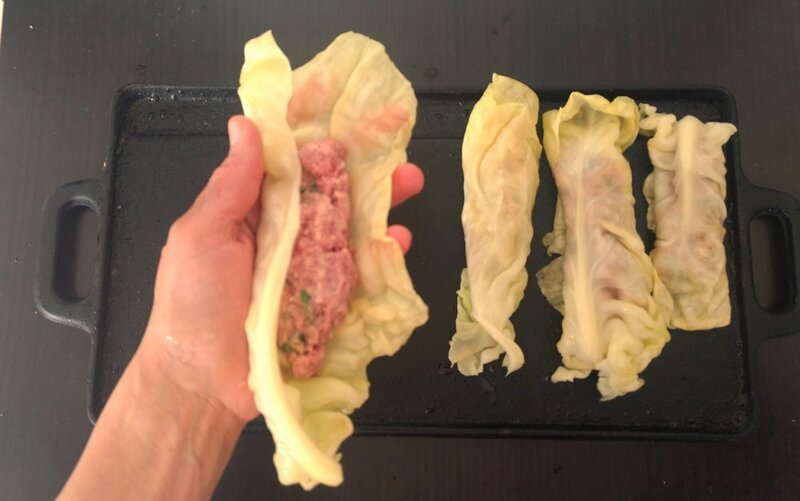 Until I was inspired by a recipe in Saveur magazine with its gorgeous cabbage rolls, I didn't even do the research on how to get the leaves to stay whole. Its actually surprisingly easy! Having a pari of tongs in your kitchen is what makes it all work. Because we do so much grilling, I have tongs on hand. A whole cabbage has enough leaves for two meals, so I freeze the left overs and use them the next time I am ready for cabbage rolls. When making this recipe I also double up on the lamb stuffing and freeze it so that I have the makings for another round for a busy day when I don't have time to go through the entire process. 1 -Cook the bacon and remove it from the pan leaving the fat. over medium-low heat, add the onions, and a pinch of salt. Cook, stirring frequently, until the onions turn a deep brown, 40–45 minutes. Remove from heat and let cool. 2- In a large bowl, add the lamb,liver, bacon, caramelized onions, parsley, mint, egg and the remaining ½ teaspoon salt. Mix well with hands until combined. 1- Bring a large pot of salted water to boil over high heat, and prepare a large ice bath. 2- Using a paring knife, make four 1-inch-wide angled cuts around the stem end of the cabbage, surrounding the core; pull the core out and discard. 3-Add the cabbage to the boiling water, core side down. Let it cook until the top leaves start to separate from the head, 1–2 minutes. 4-Using tongs and keeping the cabbage submerged in the water, carefully separate the leaves from the head. Continue to cook each leaf until just tender at the rib, 3–5 minutes; remove and transfer the leaves directly to the prepared ice bath. 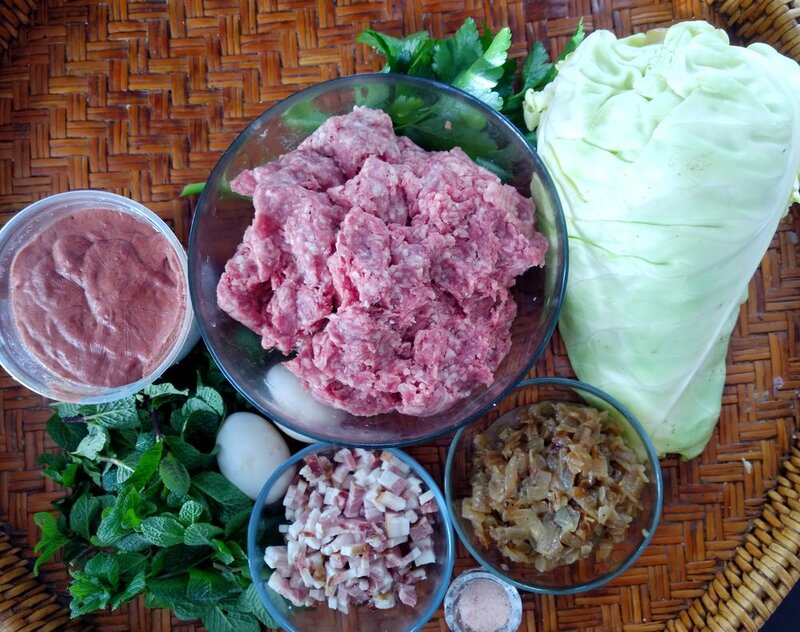 1-Spoon meat mixture into the center of each leaf, then roll the leaves tightly to form logs. Fold and tuck the ends to seal, if desired. 2-Place each one on the prepared baking dish, and place in the preheated oven and bake until the leaves are just browned at the edges and the filling is cooked through (it should register 155°F on a meat thermometer), about 35 minutes. Serve with green tahini and cauliflower rice.